HEPA air purifier for rooms 250 square feet or less in size. 150 CADR rating. These air cleaners quietly and efficiently clean the air you breathe. 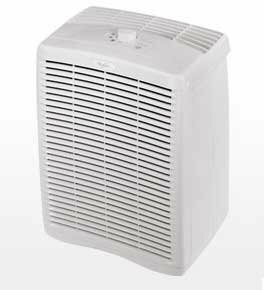 The true HEPA filter cleans the air passing through it 4.8 times per hour or more depending on the unit and room size. Anyone who is concerned with their air quality or simply wants to keep a room fresh, will feel comfortable with the performance and technology built into a Whispure air purifier. The filter captures 99.97% of particles as small as 0.3 microns from air passing through the filter, capturing airborne allergens such as dust, pet dander, smoke, mold spores, pollen, and fabric fibers. Pre-filter helps remove large particles and reduces odor from the air. Filter Replacement Indicator light provides a convenient reminder for filter replacements. I've had the Whirlpool Whispure 250 and 450 for several years now and it is a wonderful air cleaner. We get a bunch of dust each time we clean the pre filter (about every 2 weeks). They are quiet at the low speed, but a little noiset at high speed. The only caveat I have with these air cleaners, are the expensive Hepa replacement filters. It's good we onlt have to change them every 1-2 years.